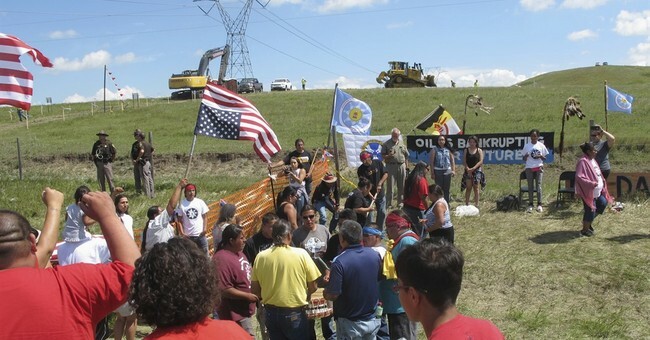 The battle over a 1,200-mile, $3.8 billion pipeline project in North Dakota is getting ugly. On September 5, AJ+, a subsidiary of Al-Jazeera, released this video showing pipeline security unleashing dogs on protestors, while saying that sacred burial grounds have been destroyed, according to tribal officials. The Standing Rock Sioux Tribe fears that the project will also impact their water supply. As for the alleged destruction of burial sites, there was an allegation that human remains were unearthed during the construction of this pipeline. That turned out to be an unfounded claim. There’s also the claim that Dakota Access LLC, the energy company building the pipeline, never consulted with local tribes. That’s false; 389 such consultations were conducted between these tribes and the U.S. Army Corps Of Engineers who issued the permit for the pipeline. It’s also built on private land, and there are archeological experts on site just in case construction runs into a sacred site. U.S. District Judge James Boasberg said Tuesday that work will temporarily stop between North Dakota's State Highway 1806 and 20 miles east of Lake Oahe, but will continue west of the highway because he believes the U.S. Army Corps of Engineers lacks jurisdiction on private land. He also said he will rule by the end of Friday on the Standing Rock Sioux Tribe's challenge of federal regulators' decision to grant permits to the Dallas, Texas-based operators of the Dakota Access Pipeline, which will cross North Dakota, South Dakota, Iowa and Illinois. Kathy Holdefer lives near the pipeline construction in Jasper County. She is against the pipeline and also against extreme measures to stop its construction. "I believe in openly opposing something. If you are against it openly oppose it, even if you get involved in an act of civil disobedience," said Holdefer. "I don't think anybody judges the thousands of us who have protested this in a very peaceable, very logical way based on the actions of one or two people. Adam Mason with Iowa Citizens for Community Improvement agrees with Holdefer. He said there is no place for vandalism in their movement. In August, Julie Fedorchak, chairwoman of the North Dakota Public Service Commission, said she hoped that cooler heads would prevail when defending approving the permit for the pipeline, according to the Bismarck Tribune. “They have a right to disagree. They don’t have the right to threaten. They don’t have the right to obstruct,” she said. But that hasn’t happened. These protestors have gotten out of control. They’ve become violent. And it looks like this project will be fought on two-fronts for both sides.